AzhwAr responding to the query whether these entities, who are created by emperumAn, take care of further activities themselves, says in this pAsuram that this is not the case; emperumAn himself removes their enemies and protects them. kaNam veruva Ezhulagum thAyanavum – vishNu dharmam says “sangaissurANAm dhivi bhUthalai: thathA manushyai: gaganE kE charai:, sthutha: ya: prakAra sarvadhA mamAsthu mAngaLya vivrudhdhayE hari: ” (let that hari, who kept his divine feet and blessed the worlds, who was worshipped by the celestial persons in swargam (heaven), by the human beings on earth and by appropriate persons in the sky, bless me for the improvement of my auspicious life!). Thus, the celestial persons who are well disposed towards emperumAn, were scared as to what will befall emperumAn when he measured the worlds effortlessly. By mentioning about the trees being broken or pushed, the way he removed danger to himself was mentioned. By mentioning about the bulls, the danger to nappinnaip pirAtti was mentioned. In a similar vein, the way the danger that fell on indhra (head of celestial entities) was removed, is being mentioned next. sUzh aravap pongu aNaiyAn thOL – emperumAn who is supposed to sleep on the soft mattress provided by thiruvananthAzhwAn (AdhiSEshan) who, by himself has qualities such as strength, fragrance, comfort and softness, carried out all the above-mentioned activities! His divine shoulders did all these! emperumAn, who has such softness that his divine body cannot tolerate that, even if he lies on such soft mattress, carried out all these activities! 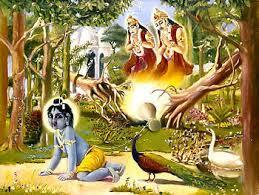 AzhwAr is desolate that instead of lying comfortably on his mattress, he is carrying out all these deeds. In SrI rAmAyaNam ayOdhyA kANdam 2-5, dhaSaratha chakravarthy says “pANdurasya Athapathrasya chAyAyAm jariratham mayA” (my physical body has withered under the royal umbrella). Since he was constantly moving about to protect his country, he had no time to rest on his throne. Only when he sits on his throne could his servants hold the pearl umbrella for him. He did not have time even for that and was busy protecting his kingdom. AzhwAr says that in the same way, emperumAn, without any time for resting on AdhiSEshan, was busy removing the enemies of his followers. Let us consider the 63rd pAsuram next. This entry was posted in iyaRpA, mudhal thiruvandhAdhi on August 11, 2017 by T N Krishnan.